A teacher’s aide at a New Jersey private school will not face charges after she was caught on cellphone video forcefully handling a toddler to put a hat on her head, prosecutors said. A grand jury ruled there was no probable cause to indict Elizabeth Gomez, a teacher’s aide at Hoboken Apple Montessori School, in connection with the May 13 incident. The cellphone clip shows Gomez grabbing at a 23-month-old girl as she attempts to put a hat on the child's head. Clearly exasperated, Gomez aggressively picks up the child and pushes her to the ground, leaving her lying there as other children play around her. Prosecutors said in a statement that the decision not to indict Gomez “should not be interpreted to mean that the behavior shown in the video is acceptable.” Instead, it means that Gomez’s actions could not be indicted as a crime. Another Apple Montessori employee, teacher Kelli Dugan, was caught on cellphone video manhandling another child at the school. That clip shows Dugan in red sitting and holding a 2-year-old girl by her legs, preventing her from moving freely. 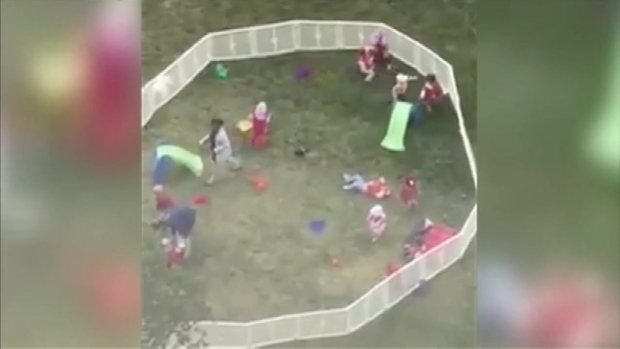 The teacher is heard cursing in the video; she yells at the child and eventually swings her over a fence before dragging her back inside. The results of Dugan’s grand jury investigation have not yet been released. The parents of the two children have filed a lawsuit seeking unspecified damages from Apple Montessori Schools and several employees for negligence, emotional damage, breach of contract, assault and other charges. Apple Montessori, which runs 17 schools in New Jersey, fired five employees after the videos were released. The terminated employees included both teachers seen in the videos and the director and the assistant director of the Hoboken school. The owners of Apple Montessori have declined multiple requests for an interview, but said in a statement to NBC New York that the owners “took immediate and definitive action” and that they have “reviewed and reinforced training” procedures. Both Gomez and Dugan declined to comment. The Hoboken Prosecutor’s Office urges anyone who knows a child is being abused to report it to the New Jersey Department of Children and Families hotline at 1-877-NJ-Abuse, local police departments, or the Prosecutor’s Office Special Victims Unit at (201) 915-1234.